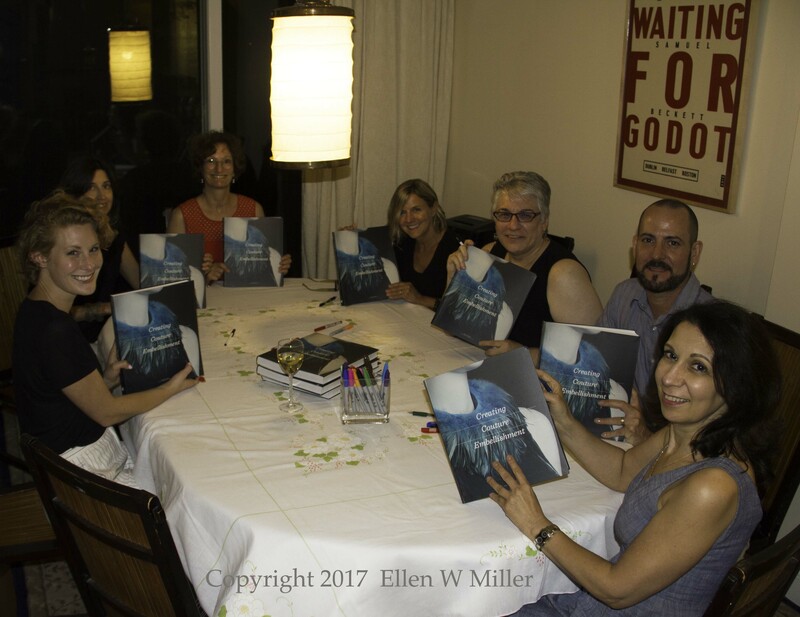 We had a Book Signing Party! Everyone has a copy of Creating Couture Embellishment! from left to right: Catherine Burkey, Jane Levin, Ellen Miller, Tracy Aiguier, Martha Palaza, Eddi Phillips, Roseanna Ansaldi. Over the seven years of creating the book I had many collaborators, many with more than one job. Anne Townley was my editor at Laurence King Publishing, although “editor”. Amy Ozay designed the spectacular bodices shown at the start of each chapter. Very early on Anne and Amy insisted, rightly, that each chapter have a consistent color theme running through it, and thus elevated the tone of the entire book. Neither Amy nor Anne could attend the book signing party and we missed them! Martha Palaza helped with the pattern making: creating the basic pattern and muslin for Faith, our mannequin for the bodices. Martha also stepped into the breach whenever my pattern making skills faltered and gently set me on the right course. Roseanna Ansaldi helped me master pleats, tucks and spiral flounces. Roseanna and I tried many fabrics for the sample for these chapters (linen, plain cotton, striped cotton, cotton polyester blends) before settling on a fine wool, notable for it’s ability to hold a crease. Jane Levin created all of the line drawings in the book, working until each drawing showed a precise moment in the sewing process with utmost clarity. Eddi Phillips designed nearly all of the amazing sleeves featured in the circles at the top of each technique. Eddi also helped choose the appropriate fabrics and trims for each sleeve, ensuring the sleeves were couture quality. Catherine Burkey designed some of the more picturesque sleeves, and worked with me day after day until all the sleeves were perfectly sewn, creating a comprehensive library of the techniques. Tracy Aiguier photographed all the bodices and sleeves, leaving me speechless with the beauty of the photographs. I could not have “written” this book without their invaluable help. Laurence King Publishing spent two years “editing” Creating Couture Embellishments: book design, layout, color correction of my photos, copy editing and text-photo matching, checking the colors of the “actions” lines in Pleats, Tucks and so forth. All the work by Laurence King Publishing transformed my Word documents into a beautiful book. But it had been two years since many of us had gotten together, and some of the collaborators had never met each other. The release of Creating Couture Embellishments was the perfect reason to have a party together. My husband and I made Swiss Chard Spanakopita and a big salad. We had wine, beer & ice tea. For dessert we had cake & ice cream. In between the main course and dessert my fellow artisans and I sat at one table to sign books. You would think that our spouses/partners would cheer us on as we signed books—you would be wrong! They ignored us and carried on with own conversations that had nothing to do with fashion. Luckily, my niece Alice (of Kimono blog fame) was suitable impressed by all of us and took pictures to commemorate the occasion. We tried to stretch dessert so we could talk for hours but we had to disband about 10 pm as everyone had a long drive home and work the next morning. It was a wonderful party to celebrate a unique event: Signing Creating Couture Embellishments!